The Wildwoods, NJ – March 25, 2019 – Morey’s Piers, located in the Wildwoods, NJ, kicks-off a season of 50th anniversary celebrations with a new spring festival from Friday, May 3 through Sunday, May 5. 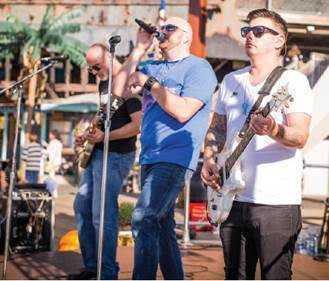 WildwoodStock will rock Mariner’s Pier with a full line-up of live entertainment, kids’ activities and culinary offerings like themed treats and free samples of the Morey’s Piers 50th anniversary Dippin’ Dots flavor. Bands will take the Coca-Cola branded stage at Mariner’s Pier near the Giant Wheel starting Friday at 6:00pm through Sunday at 4:00pm. The full line-up can be found at www.moreyspiers.com/wildwoodstock. Guests can also visit Jumbos’ Grub & Pub for more live music paired with classic boardwalk eats. Morey’s Piers is throwing it back to its summer of ’69 roots and is spreading the love with a social media contest for married couples to enter to win a vow renewal ceremony. Jack Morey, second generation partner, will officiate the group ceremony for fifty lucky couples on Saturday, May 4 at 1:00pm in front of the iconic Giant Wheel. From March 25 to April 22 married couples of all ages and length of marriage can enter to be one of the fifty winning couples who participate in the group vow renewal ceremony by posting a fun wedding photo using #MoreysWildWedding via Facebook, Instagram or Twitter and tagging @MoreysPiers. Fifty duos will be chosen at random, all fifty couples (100 people) will participate in the vow renewal ceremony with a champagne toast, and each winner will receive ride passes valid for Saturday, May 4 and Sunday, May 5 plus a $50 dining card. Social media fans will then choose the grand prize winner of the #MoreysWildWedding contest by voting on their favorite photos from April 27 through May 3. The grand prize is a two-night stay at a Morey Resort, Breakfast in the Sky for two people (based on availability), a Wildwood helicopter ride for two from East Coast Helicopters, and two ride and waterpark passes valid for three days. The winners of the grand prize will be announced on Saturday, May 4 right before the vow renewal ceremony. Prize must be redeemed during 2019 season. Visit https://woobox.com/fyn8qd for contest rules and more information. WildwoodStock ride wristbands will be available for purchase online starting April 1 through May 5 at www.moreyspiers.com/wildwoodstock. Online tickets are priced at $24.95 for guests 48” inches and taller and $19.95 for those under 48” and include a $5 food and beverage credit. Three-day ride wristbands valid from Friday-Sunday are available for purchase both online and onsite. Prices are $39.95 for guests 48” inches and taller; $34.95 for those under 48”. Tickets purchased onsite for Friday/Sunday are $24.95 for visitors 48” and taller and $19.95 for those under 48”. Onsite Saturday passes are $29.95/$24.95 respectively. Mariner’s Pier located at Schellenger Avenue hosts WildwoodStock from Friday, May 3 through Sunday May 5. The pier will be open from 6:00pm to 10:00pm on Friday; 12:00pm to 10:00pm on Saturday; 12:00pm to 5:00pm on Sunday. For more information on WildwoodStock visit: www.moreyspiers.com/wildwoodstock .